Opinions about taxes tend to reveal what constituents think about how their government is operating. "The dollars you pay in taxes are your contribution to what should be the public good as decided by a democratic process, and when it doesn't live up to that ideal people get frustrated," said Vanessa Williamson, a senior fellow in governance studies at the Brookings Institution. Nearly half of all federal revenue comes from individual income taxes, and with taxes due Monday, there's no shortage of opinions on where and how tax dollars should be spent. Things are generally less partisan at the local level, where both Republicans and Democrats are content with their hard-earned dollars being invested in schools, roads, hospitals, parks and even sewer systems, according to surveys Williamson conducted to understand which areas of tax spending were the most supported and opposed. Partisan divides occur mostly with health care and spending on the poor, said Williamson, author of "Read My Lips: Why Americans Are Proud to Pay Taxes." "There's a lot more concern on the Republican side that undeserving people are benefiting and there's more of a sense from the Democratic side that those investments are important to keep all Americans above a certain threshold of poverty," she said. And while fiscal year 2020 is projecting another deficit, with President Donald Trump's request of $4.74 trillion and an estimated $3.65 trillion in revenue, Williamson said it's important to prioritize spending. "The question is are the investments we're making with that money good investments?" she asked. "I think there's real variation in the return that we see." 25 percent to Social Security — estimated at $945 billion — this paid retirement benefits for 42 million retired workers who received average monthly benefits of $1,404. 25 percent to Medicare, Medicaid, CHIP and the Affordable Care Act. These four programs together cost about $1 trillion in 2017. Those who are aided by Medicare — people over the age of 65 or those who have disabilities — comprised about three-fifths of the total spending in this category at a total of $597 million. 16 percent to defense and international security — $611 billion was spent on areas such as the Defense Department and operations in Afghanistan. Williamson said defense spending is separate from Veterans Affairs, even though decisions about whether to engage the military can have long-term costs. "The war itself is of course extremely expensive and costly, of course in lives," she said. "But we also forget that the folks coming home from those wars need to be looked after." Williamson said that while spending on foreign military engagements is somewhat unpopular among Americans, taxpayers strongly support spending on service members themselves, both while in service and after they've returned home. 10 percent to safety net programs. These programs provide aid, separate from health insurance and Social Security, to people who need financial help. In 2017, these costs amounted to about $357 billion. This fund supports earned income tax credits and child tax credits, cash payments for low-income people, supplemental security income for disabled people and SNAP, the food stamps program. 7 percent to interest on debt. By the end of 2017, federal debt was at $15 trillion, and that doesn't come cheap. Interest payments that year were $263 billion. 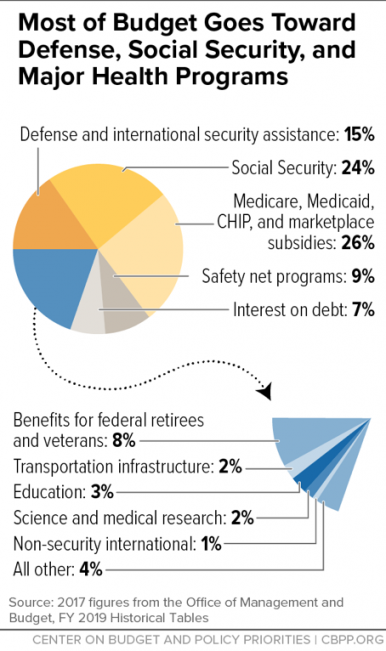 The remaining fifth of the budget is divided into numerous other areas, including: Benefits to retired federal employees and veterans, transportation, education, science and medical research, non-security international or humanitarian aid, and "all other." While Tax Day is right around the corner, many taxpayers do not know exactly where their federal income taxes go. We talk to a tax expert about how that money is allocated by the government and the public's opinion on where their money goes. Walker, Evers Both Promise Tax Cuts, But Are Voters Still Interested?